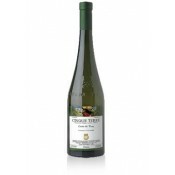 This dry white wine is made from grapes grown in a specific and historical area known as Cinque Terre and is produced by a company that pays particular attention to its land and its products. The wine is distinguyished by a unique hint of flowers and meddow herbs. Appellation or Vine Cinque Terre D.O.C. 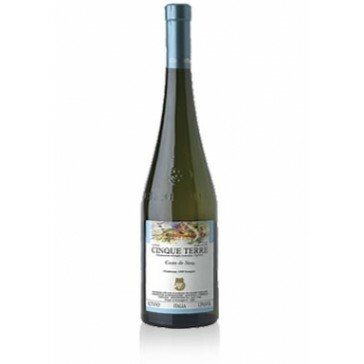 This white wine is made from grapes grown in an historic area called "Costa de Séra di Riomaggiore", which is in the heart of the Cinque Terre. This area has a long history of wine-making. The wine is the result of the careful selection of grapes particularly suited to the local climate, and of a willingness to transfer the wine. The wine is a heavily laden straw-yellow colour with a light gold reflection. Predominently, its aroma is identified by a unique hint of flowers and meddow herbs. The taste is the perfect balance of savory and mellow. Over the course of centuries the hostile natural forces in this area have been tamed by man. Dry-stone walls and terraces have changed the landscape permanently. In fact, the perfectly tuned balance between man and the environment is the most amazing and mysterious thing about this area. The Cantina Cinque Terre operates in a community spirit, carrying out the difficult job of maintaining the land, but also pricing its products. This wine is excellent with fish, in particular fish used in typical Ligurian cooking, but also goes well with first courses based on pasta. Serve at 10-12 degrees centigrade in clear, transparent crystal goblets. This isn't a wine that should be aged and must therefore be drunk within two or three years of purchase at the latest. The bottles should be laid horizontally in a cool, dark, humid wine-cellar.